She ran her strongest race at the Olympics in Beijing in 2008: 10,000 metres in her personal best of 31:14.21 minutes. PUMA athlete Sabrina Mockenhaupt, German long-distance runner, holder of 44 national champion titles, three-time Olympic participant, and winner of the Frankfurt and Cologne marathons seems to be surprised herself. 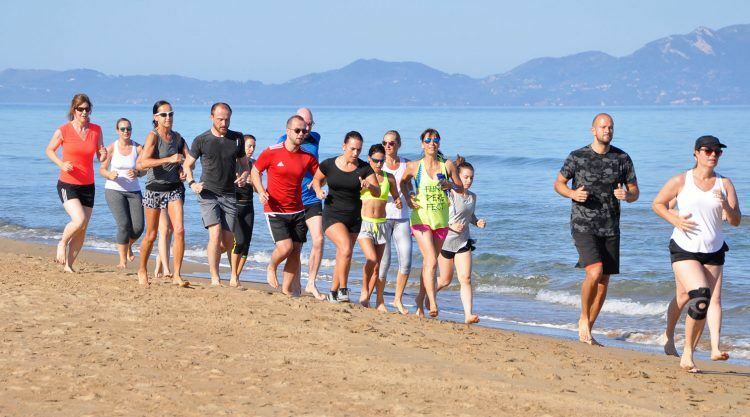 “Looking at that time, I am wondering how I was able to do that back then,” the 36-year old says during the “Get Stronger Week by PUMA” run by Best Reisen at holiday resort ROBINSON Club Kyllini Beach in Greece. In the running world, 36 is considered old. Sabrina, however, is still more the wheat than the chaff. 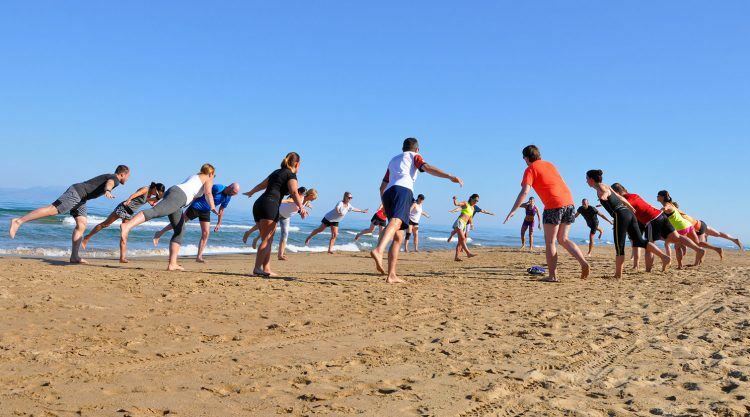 Twice a day, the petite, 1.56m-short, but muscular brunette holds running sessions for the 500 sports-fanatic PUMA fans and holiday guests – either at 8:30 in the morning at the beach or in the afternoon in hilly terrain and Greek heat. Complaints of hurting calves, as running in the sand is hard on the leg muscles, are frequently heard from guests throughout the resort. “Man, this was tough,” says Ahmad, red-faced after a hilly run. Sabrina herself considers this workout routine to be nothing. “When I am seriously training for races, I run up to 160 kilometres per week,” she says. 25k per day. Currently, she is still taking it slowly, while she is getting back on track after a string of injuries that haunted her in the last two years. “After this week, I will be going serious again.” Her next big thing: the marathon at the European Championships in Berlin next year. “I need to qualify for this through a marathon this year, but I haven’t decided which one to go for – either Berlin or Cologne.” What she thinks she can do in terms of time? “Under 2.30 of course,” she says determined with a big, charming smile on her face. Running marathons will be more on her agenda now until Sabrina plans to end her athletic career at the age of 40. “When you get older, it is more marathons than shorter distance races as your speed decreases with age.” In her career of more than 20 years as an athlete, she ran over 100,000 kilometres, including eleven marathons – an impressive record that requires an immense amount of determination, persistence, courage and willpower. Sabrina does not seem to be soft on herself. “I am always late”, she says, after she rocks up five minutes early for the morning beach run. Apparently, she also partied hard the night before, which you cannot tell. Fit and full of energy, she’s already put on her notorious laughter and chats away with the other runners. “So glad that my boyfriend said it would be good to go to bed at 1:30. I would have partied away.” Sabrina indeed amazes with how approachable and unpretentious she is and often shares personal details without any hesitation, mostly followed by a hearty laugh about herself. A combination between enjoying life and working hard seems to be Sabrina’s key to success and an attitude that she took on after some tough experiences in her career. “Whenever I wanted too much, I ended up broken on the ground,” she remembers her exhaustion in the World Championships in Moscow in 2013 before she was able to reach the finishing line. “Success comes when you expect it the least.” That same year, the success came a few months later at the New York marathon, where she finished 7th. And if you doubt yourself, just remember that even to professionals marathons do not come easy. “A marathon is just pure torture,” Sabrina says, just before she is about to train for the next one. During the morning sessions, Sabrina focused a lot on training the feet. “This was most useful, as I have never done this before, but noticed how essential it is when you run”, said Ahmad. … as everybody calls her, was born on 6 December 1980. She is a professional Sports Soldier at the Federal Armed Forces. How do you increase your performance? Do not train when you are tired. Bring variety into your training schedule. You are just good at what you train for. The older you get, the more focus should be on quality rather than quantity. If you don’t like it, you need it.